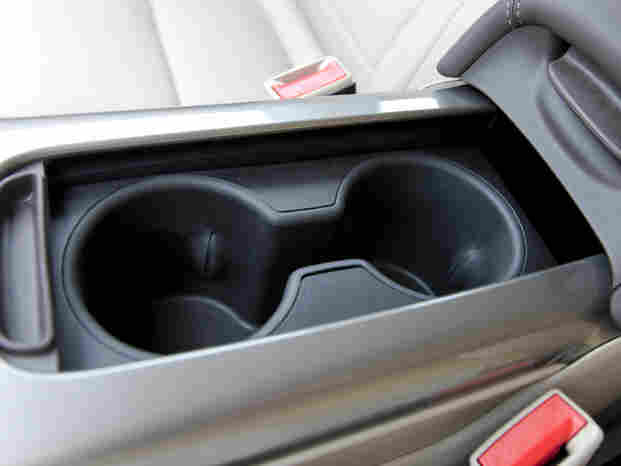 Men Are From Mars, Women ... Love Cup Holders? Advertising and marketing aimed at women is often really better aimed at parents. Getting past the cup holders in a new car might be a first step. Men Are From Mars, Women ... Love Cup Holders? When you read the words of Clotaire Rapaille, a "French-born psychiatrist-turned-marketer" quoted in yesterday's interesting Slate article about the marketing of cars to women, it's hard not to read them in a voice that's sultry and French and not entirely serious, as if he's some kind of sales expert crossed with Pepe Le Pew (despite the fact that this doubtless has no basis in reality). Rapaille told writer Libby Copeland that women just loooooove cup holders. Love them, love them, love them! They want four in front! More in the back! Cup holders for everybody! Rapaille says women love cup holders because — and this is really what he told her — cup holders mean coffee, and coffee means safety, because of the memories we all have of our mothers preparing coffee with breakfast. Copeland points out that Rapaille once told Malcolm Gladwell how surprising it is that "intelligent, educated women will look at a car and the first thing they will look at is how many cup holders it has." Copeland presents a different hypothesis later in the article: that women ask a lot of questions about cup holders and other little things once they're at the dealership because they actually do more research ahead of time, so by the time they're on the lot, they're sweating the small stuff. Maybe, maybe not. But quite frankly, when I was recently shopping for a new car, I was pretty surprised when the car salesman — undoubtedly doing what he'd been taught — went out of his way to identify an "extra cup holder" in the car he was showing me. I mean ... as a single person, the most likely arrangements of people in my car are (1) just me, or (2) me and one other person. He knew this about me already, because car salesmen begin assembling a complete mental dossier on everything you have ever said about yourself as soon as you show up; it's what they do. And knowing what he did, he was still pointing out what amounts to a fourth cup holder accessible from the front seats. Quite honestly, I like coffee, but I'm not that thirsty. For the most part, four cup holders just mean more leeway to forget to throw out yesterday's coffee cup. I have to wonder whether cup holders aren't as much a thing with women as they are a thing with people who drive around a lot of kids. Statistically, those people might be more likely to be women, but it brings to mind one of the things I expect to change in the next 20 years in the marketing world: a reduction in the marketing to "women" and "moms," and an increase in the marketing to "parents." For example, if my sister and I both shopped for cars, we'd need completely different things. Why? Because she's got kids to tote around on road trips, to baseball practice, with unexpected gaggles of other kids, and so forth. Copeland points out a dopey Ford Flex commercial where a bunch of mothers — who are actually referred to as "Real Housewives," bleh — talk about the fact that their new Flex is cooler than a minivan and doesn't embarrass their kids. Putting aside the issue of whether parents ought to buy cars to impress their children, there's no reason whatsoever that all the people in the ad had to be women. None at all. Dads are just as likely, in my experience, to lament the perceived uncoolness of their minivans as women are. They're plenty aware of the implications of being a minivan person versus a "cool" car person. The same thing came to mind when the "Amazon Mom" program appeared. It offers discounts and deals on things like diapers, and Amazon points out that it's "open to anyone expecting a baby or caring for a baby or young child, whether you're a mom, dad, grandparent, or caretaker. We just thought 'Amazon Primary Caretaker' didn't have the same ring to it." Har har! Why not "Amazon Family," which happens to be what they call a similar program in the UK? Sure, a dad can join "Amazon Mom," but if there were a program called "Amazon Dad" aimed at parents who work long hours, it wouldn't make me feel any better (or make it any less gender-gross) if they said a mom could join as long as she was willing to be an "Amazon Dad." Moms are dads! Dads are moms! Cats are dogs! Chairs are tables! Words have meanings, you see. Much of the marketing that targets women — all the "What will I feed the family that's healthy and affordable?" marketing, all the "beleaguered laundry-doer to a crowd" marketing, all the "quizzical in the grocery store over what my picky 8-year-old will eat" marketing — is actually marketing to parents, and it all applies to plenty of dads, every day, all over the place. Dads also worry about what to pack in a lunch box, and also feel frustrated by getting home at the end of the day and being expected to cook or being at home full-time and dealing with the messes of that. Why ignore them? When marketing is so specifically about moms, it not only doesn't particularly appeal to dads, but I suspect it alienates them. That's especially the case when the ad universe's "Mom," the parent who's running the house and collapsing at the end of the day, is contrasted with "Dad," the parent who dips the kid's feet in paste rather than buy socks and needs Mom to say, in these words, "That's really stupid." This debate about decoupling the needs of parenthood from the needs of women — since to say parents are the same thing as women is both underinclusive and overinclusive — pops up not just in small things but in large ones. Public- and private-sector policies about work-life balance are often referred to as a problem of motherhood, when in fact work-life balance is an issue for both mothers and fathers, and for both parents and non-parents. Much depends on how you frame an observation. Saying "women like a lot of cup holders" makes women sound obsessed with trivialities, or the safe embrace of coffee. But saying "some people, who are statistically more likely to be parents of kids and to drive them around a lot, like to have lots of places to put stuff" — well, that makes all the sense in the world if you've ever seen a parent sitting at a red light, reaching behind his seat into a canvas bag on the floor to fish out a juice box and then contort himself to pass it off to a child strapped into a car seat. Perhaps if car marketing (and other marketing) could more thoroughly disconnect marketing to parenthood from marketing to gender, we could keep the things that make sense — like showing parents of both genders how much their kids will love back-of-the-seat video screens that mean no one has to play the license plate game ever again* — and lose the things that don't. *Does not apply if you love the license plate game. Which you should. Of course, the top result for a form you can fill out to play the license plate game comes from a site called "Mom's Minivan." Sorry, dads! Your kids will just have to stare at the back of your head like chumps.